The Catholic Foundation is excited to announce a new initiative designed to bring Catholic business leaders together. Catholic Business Leaders (CBL) provides a unique, Catholic faith and business learning experience for family enterprise owners and corporate executives, rooted in the dignity of work, and in the spirit of community philanthropy. 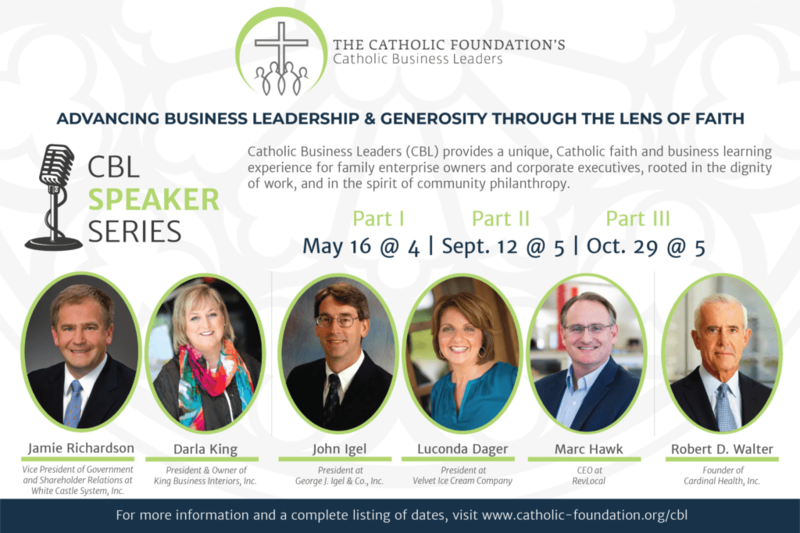 Catholic Business Leaders will offer a three-part Speaker Series every year, hosted at The Catholic Foundation. Other benefits include: Acquire new insights and perspectives from regional enterprise speakers and national subject-matter experts; Exchange and discover new perspectives and solutions that impact your workplace and benefit your home and family; and Network among peers, make new connections, help build a larger, Catholic business community throughout Central Ohio. Speakers: Jamie Richardson, Vice President of Government and Shareholder Relations at White Castle System, Inc. and Darla King, President & Owner of King Business Interiors, Inc.
September 12: Part II – Balancing Your Business & Philanthropy – It’s Possible! Speakers: Bob Walter , Founder of Cardinal Health, Inc. The first part of the CBL Speaker Series will be on Thursday, May 16 and the topic is, Navigating Faith & Family Dynamics – at Work, Home, and Across the Generations. Speakers are Jamie Richardson: Vice President, Government and Shareholder Relations at White Castle System, Inc. and Darla King: President & Owner, King Business Interiors, Inc. The event will run from 4 p.m. – 6 p.m. in the Ruth Lang Board Room of The Catholic Foundation (257 East Broad Street | Columbus, OH). To RSVP for this event, please contact Liz Lynch (llynch@catholic-foundation.org or 866-298-8893). For more information on Catholic Business Leaders and to learn about the other speakers in the CBL Speaker Series, please visit www.catholic-foundation.org/cbl or contact Scott Hartman, shartman@catholic-foundation.org.